Forever Lean™ provides two revolutionary ingredients that can help reduce the body’s absorption of calories from fat and carbohydrates. The first of these ingredients is a unique, fatabsorbing fiber derived from the cactus plant, Opuntia ficus-indica, otherwise known as Indian fig, nopal or prickly pear. Studies have shown that this unique fiber has a very high ability tobind fats, compared to other types of plants. 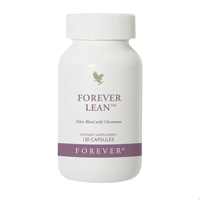 The other unique ingredient in Forever Lean is a protein specially derived from the beans of the Phaseolus vulgaris plant, otherwise know as white kidney beans. This protein works by slowing the body’s absorption of sugar in the small intestine by temporarily inhibiting the enzyme activity that converts starches into sugar. Together these two revolutionary new ingredients can help you succeed in your quest to reach your ideal weight by helping to block the absorption of some of the fat and carb calories you ingest. The third most effective ingredient in Forever Lean is Chromium Trichloride. Chromium is a very important trace mineral which helps the body’s natural ability to regulate blood sugar by acting as a GTF (glucose tolerance factor) cofactor. This is especially important for normal metabolism. To maximize the effectiveness of this supplement, however, it is important to remember that youshould also incorporate a healthy diet and regular exercise into your overall weight control regimen in order to achieve and maintain your weight goal.